Cultivate relationships with existing donors and encourage them to reach higher levels of giving. 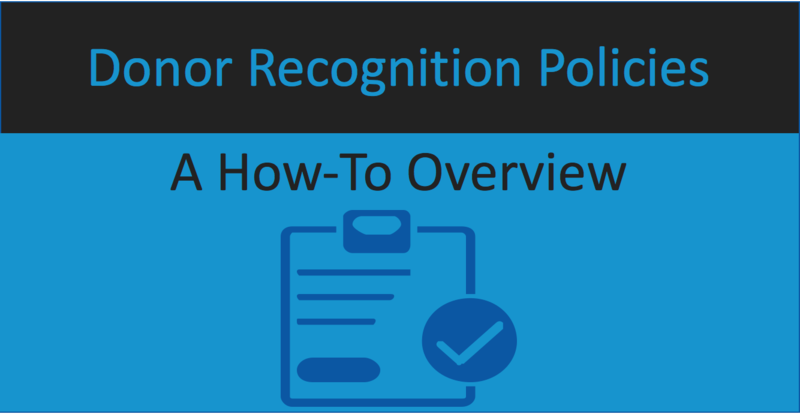 Ensure that, in fairness to donors to the organization, one clearly stated policy of recognition is applied at all times. A Donor Recognition Policy must have board approval and, once adopted, be shared with your major stakeholders. Through sharing the Donor Recognition Policy, the organization will increase the level of confidence of the board, volunteers, donors, and staff in the organization and will help raise more money. We’d like to thank Diana V. Hoyt for contributing this post! Diana V. Hoyt has over 30 years of professional and volunteer fundraising experience. As President of Heritage Designs, Diana markets MatchMaker FundRaising Software and provides fundraising consulting services and training to nonprofits. Diana chaired the AFP Donor Software Workgroup from 2008 through 2012 and served on the AFP International Research Council. Diana holds a Bachelor’s degree from Kansas University and a Master’s degree from Arizona State University.